Tissot crafts a beautiful and elegant timepiece that is defined by its accent of smooth white ceramic that sits on stainless steel and embellished with diamonds on the dial for a luxury edge. 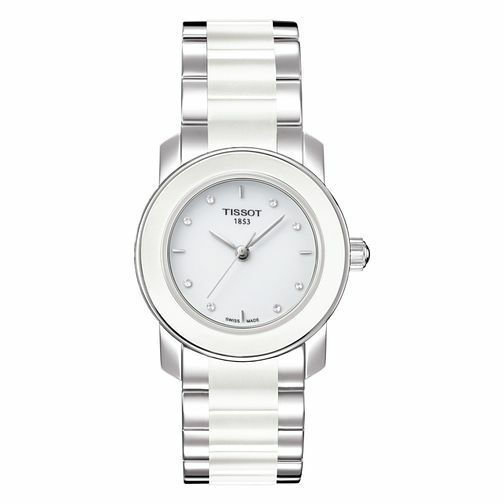 Tissot Cera Ladies' White Ceramic Diamond Watch is rated 5.0 out of 5 by 2. Rated 5 out of 5 by Anonymous from tissot watch I saw this watch on a cruise and liked it but i waited till i got home and what luck it was in the sale it is a lovely watch just what wanted. Rated 5 out of 5 by Anonymous from Classy looking watch Very happy with my purchase, beautiful watch, good quality and the little diamonds add style and class to it.